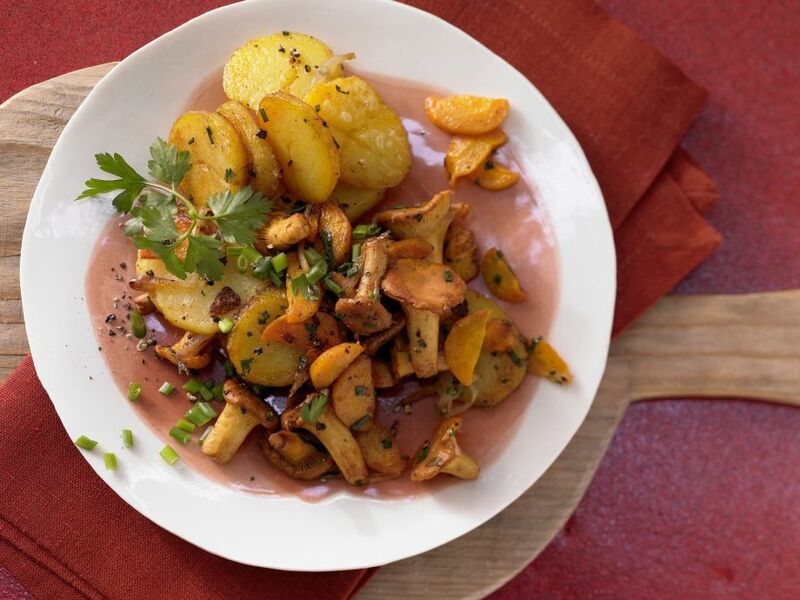 Chanterelle Potatoes - An autumn treat from Austria! 1 Scrub potatoes and boil in salted water until knife-tender, about 25 minutes. Peel while still hot and let cool. 2 Peel the shallots, cut in half lengthwise and cut into thin slices. 3 Peel the carrot. Cut in half lengthwise and cut into thin slices. 4 Carefully clean chanterelles with a brush. (Rinse briefly and pat dry only if necessary.) Cut large mushrooms in half lengthwise. 5 Rinse the parsley and chives and shake dry. Pluck parsley leaves and finely chop. Cut chives into thin slices. 6 Cut the potatoes into thick slices. 7 Coat the bottom of a large non-stick pan with as slick of oil. Fry potatoes and carrot over low heat until the potato slices are golden brown and crispy. Season with salt and pepper. 8 At the same time, heat the remaining oil in a second large non-stick pan. Cook chanterelles and shallots over medium heat for 5-6 minutes. 9 Mix chanterelles, parsley and chives into potato mixture and heat through. Season with paprika, salt and pepper and serve.